TRUTH: 80% of what you do every day is a complete waste of your time. It's bogging you down. It's getting you nowhere. And it's taking your energy away from the few things that really do contribute to your success. Do you want to know exactly which actions in your life make up that useless 80%? Do you want to find out how to eliminate those actions … still accomplish everything you need to do … and have time left over to spend any way you choose? Then read and discover the scientifically-proven secret* to having much more by doing much less! *You may already know what this secret is. But you have no idea how profoundly it can transform your life! Too much to do, and too little time. It's the universal challenge of the modern age, isn't it? You wish you had a few extra hours in your day, or a couple of extra days in your week, just to get all the stuff done. The calls made, the messages returned, the appointments scheduled, the meetings sat through, the bills paid, the papers organized, the errands run, the house cleaned, and on and on and on. And free time, time every single day to really retreat, relax, think, and enjoy yourself? Forget about it. That's what vacations are for. Or at least, that's what they used to be for, until cell phones, tablets, and e-mail came along to make "getting away from it all" an obsolete concept. But the fact is, the stuff isn't going anywhere. If anything, there's just going to be more of it in the years to come. So there's only one solution: learn to somehow work harder, work faster, and work more… right? My name is Richard Koch. I'm here to offer you an alternative. A scientifically-proven secret that will enable you to get all of life's "stuff" done by working less, not more… and be happier, calmer, and on top of it all, far more successful than you are right now. I didn't invent this secret. Actually, no one did. It's a simple yet amazing fact of nature, and it's as old as the hills. I'm also not the first person to observe the practical power of this secret. Plenty of people have talked about it — in fact, you've probably heard people talk about it. Yet it remains remarkably underexploited, even by the people who know it! But I have done something with this secret that no one else in the world has ever done before. I've created a system that will show you how to practically apply its power to every single aspect of your life. When you do, you will experience a personal transformation unlike any you've known before. Sound impossible? Well, suspend your skepticism for just a moment, and allow me to explain why this natural, scientifically-proven principle is the solution your busy life is crying for. The secret I'm referring to is known by several names. Maybe you've heard it called the Pareto Principle, or the 80/20 Rule. I call it The 80/20 Principle. The 80/20 Principle states that 80% of results, rewards, or outputs are generated by 20% of causes, efforts, or inputs. In other words, when it comes to getting the results you want, only a very few things you do really matter. The rest… well, they're just a waste of your time. Business philosophers love to talk about the 80/20 Principle, because it applies so clearly to corporate situations. You've probably heard it said that 80% of revenue comes from 20% of customers, or that 20% of a company's staff generates 80% of its productivity. These fascinating little statistics demonstrate the truth of the 80/20 Principle — and the fact that, like it or not, it has an impact on your life. Interesting, you're probably thinking. But where is the power he keeps talking about? Well, the real power of the 80/20 Principle — the secret to using it as a tool for massive life transformation — lies in finding, focusing on, and exploiting the most important 20% of your outputs in every situation in your life. I'm not about cheating or cutting corners. I'm talking about learning to identify the things that matter most to you and add the most value to your life… shifting the majority of your energy and attention to those things… and disregarding everything else. In theory, applying the power of the 80/20 Principle is really quite simple. In practice, it's much easier said than done. That's why I teamed up with Nightingale-Conant to create The 80/20 Principle: The Secret to Success by Achieving More with Less. In it, I give you dozens of different ways to systematically apply the power of the 80/20 Principle in your business, your career, your relationships, your finances, and your thought processes. I'll teach you how to work with this natural imbalance of the universe instead of fighting against it. Once you understand how to do that, you will have the ability to dramatically reduce the amount of time and effort you expend, while dramatically increasing the quality of the results that effort gets you. You'll have much more, and you'll get it by doing much less. Maybe you're wondering why, if it's so darn powerful and life-changing, the 80/20 Principle has remained largely untapped — a "secret" sitting right under our noses. The reason is, the 80/20 Principle is counterintuitive. It goes against everything we've all been raised to believe about the way the world works. You see, we've all been ingrained with 50-50 thinking. We intuitively believe that hard work will bring about equal results. That cause and effect are equally linked. The 80/20 Principle demonstrates that just the opposite is true. The world is imbalanced. Everything isn't fair. Working really hard doesn't necessarily mean you'll be amply rewarded. And hardly working at all can sometimes make you a multi-millionaire. That can be a very difficult idea to get your head around. It can be even harder to put it into practice. After all, we're programmed to believe that a truly productive workday must consist of eight hours at a minimum. It can feel impossible to cut that down to just one or two hours, even when the results you're generating are the same or even better. But it's not impossible, once you know how to shift your mindset. In The 80/20 Principle, I'll teach you how to start "thinking 80/20." You'll learn how to look at any situation — from your marriage to your money habits to the way you approach your work day or run your company — and instantly separate the few actions that bring you the greatest results from the things that take up most of your time but give you very little in return. I'll show you what you can do to delegate or otherwise eliminate those time wasters. And then I'll tell you the best ways to zero in on that key 20%, expand and exploit it so that it yields even greater results. Are you smart enough to be lazy? Once you begin applying the power of the 80/20 Principle, two things will happen. First of all, you will become an infinitely smarter and more effective person, because you'll be focusing it only on activities that you are good at and enjoy. Secondly, you will suddenly find yourself with enormous amounts of free time on your hands. You'll be more intelligent. But you'll also be lazy. And that is a magical combination. Yes, that runs contrary to everything you've ever been taught or believed about success, happiness, and upright living. But over and over again, the 80/20 Principle proves it to be true. When intelligence meets laziness, something extraordinary happens. In The 80/20 Principle, I'll tell you what this extraordinary thing is, and how people throughout history — from Winston Churchill to John F. Kennedy to Warren Buffet — have ridden their laziness to wild heights of success and used it to achieve great things. You can do it too! I'll show you how. Success though laziness? It may sound crazy, but it's the way of the world. And I absolutely guarantee that you will have more of everything you want (and less of everything you don't want!) once you learn how to embrace it. So many people today speak of a sense of dissatisfaction… of something missing in their lives. Another way of putting it is "imbalance." You see it in people who have a great career, but disastrous relationships. Or a wonderful family life, but a horrible financial situation. Or plenty of money, but an unfulfilling job they hate. The funny thing about the 80/20 Principle is that — although it reflects the natural imbalance in the universe — it has the power to restore the internal balance that many of us have lost. The 80/20 Principle will empower you to stop spreading yourself thinly over a broad spectrum of activities, thoughts, and relationships. Instead, you'll be delving much more deeply into just a few: the few that matter most and create the most overall value in your life. At those deeper levels, you will finally find the answers to your most pressing questions and solutions to your greatest challenges. It's not that they don't exist. They simply exist at a level deeper than ordinary 50-50 has allowed you to access. Find your critical 20% today! I guarantee that if you use the simple strategies I share in this program, you'll quickly be able to identify and eliminate the activities that waste your time and get you nowhere … and find and concentrate on the few efforts that bring you the greatest results. At work, at home, wherever you decide to apply this principle, you'll suddenly find yourself with more free time than you'll be able to believe. And that time won't come at the expense of anything else! You'll still get everything done. And you'll get it done faster and better, because you won't be bogged down and distracted by all of the meaningless activities that are sucking up your time today. Find out for yourself! Click the link below to order The 80/20 Principle today. Put these strategies to the test and experience their amazing benefits in your life. Very little of what you do actually enriches your life. By figuring out what those things are and concentrating primarily on them, you will automatically multiply your success and happiness. Applying the 80/20 Principle is the single best way to transcend the pressures of modern life and find the leisure, happiness, and success we're all looking for. Discover the wonder of this amazing little secret for yourself. P.S. The notion that time is a shrinking commodity is a myth. You have plenty of time — far more than you need to achieve your goals and enjoy yourself. The problem is, you're using your time in all the wrong ways, without even realizing it! Root out the useless, valueless, meaningless activities that are taking up 80% of your time, and discover how to eliminate them so you can focus on the things that will bring you the highest degree of success — at work, at home, and in every other part of your life. I want to learn the simple secret to achieving more by doing less! 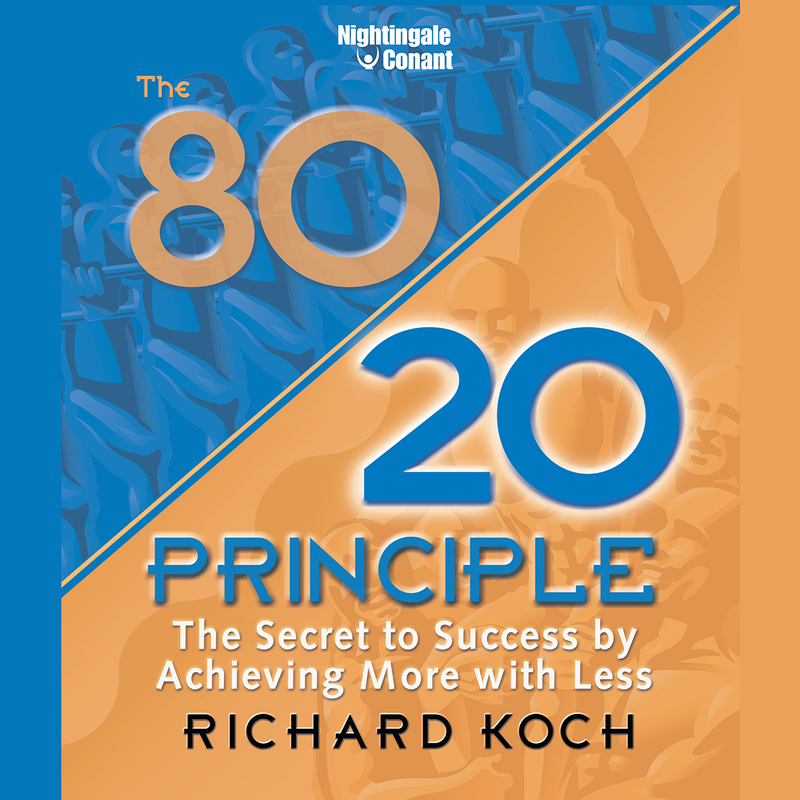 Please send me Richard Koch's audio program THE 80/20 PRINCIPLE, at the special price below. - I can select one of two ways of ordering. Richard Koch is a bestselling author and highly successful entrepreneur, whose ventures have included consulting (LEK), personal organizers (Filofax), book publishing (Capstone), hotels (Zoffany), restaurants (Belgo), and premium gin (Plymouth). He was formerly a consultant with The Boston Consulting Group and a partner of Bain & Company, has advised private equity groups around the globe, and is a world-renowned expert on the successful application of the 80/20 Principle.